When you work inside a retail wine shop, your exposure to the wine industry is a bit one-sided. We see a skillfully crafted, finished product. A beautiful wine, inside a beautiful package, that customers pick up for a variety of reasons. It is a package that elicits a wide range of emotions and caters to varied tastes and desires. That, of course, is just one side of the wine equation. Behind the scenes, there is an incredible amount of planning, scrambling, organizing, cooperating, praying and hard work. 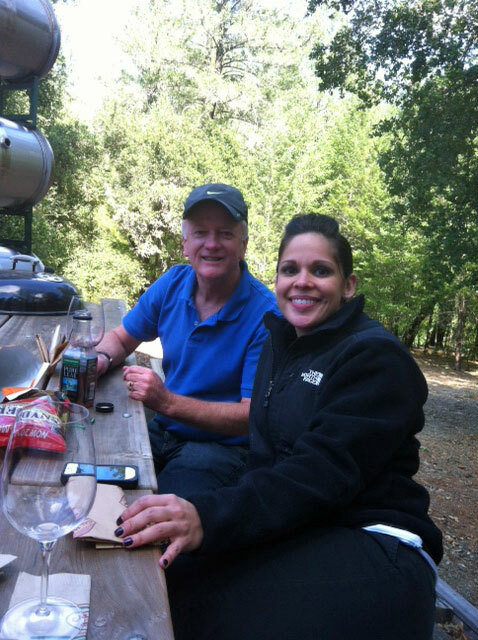 I was part of a small group from Total Wine & More invited to experience this other side at the Amici Cellars’ “Harvest Boot Camp” in Calistoga, Ca. 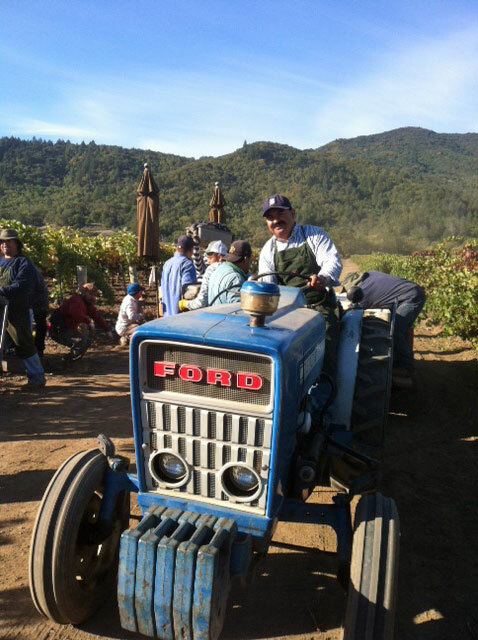 For a week, six of us joined the Amici crew to participate in the 2013 harvest. 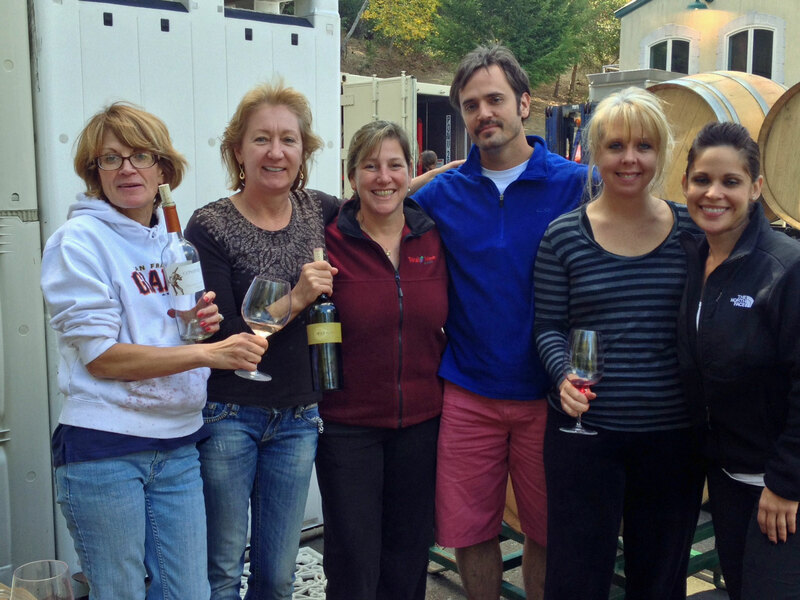 We contributed our labor and lived the winery life alongside owners, winemakers and interns. Our adventure started on a Sunday night this past October. We all arrived at the Amici guest house from different parts of the country. The crew for the week included Robert Emery from our Chantilly, Va., store; Sharon Deangolis from Delaware; Rebecca Davidson from Reno; Jen Vizcarra from Roseville, Ca. ; Theo Snyder from Arden, Ca., store; and me, Carrie Boyle from Folsom, Ca. Our host the first evening was John Harris, co-owner of Amici. He fed us, opened wine and gave us a preview of the week to come. Once he departed, we settled in for the night, knowing our work would start at 8 a.m. When the morning arrived, and everyone had sufficiently caffeinated themselves, we walked up the steep driveway to the winery, where we were greeted by assistant winemaker Bobby Donnell, winemaker Joel Aiken and co-owner Bob Shepard, plus three interns – hailing from around the world and at various stages in their winemaking careers. Our task for the day was to line up alongside the sorting table as 16 bins of fruit, equaling eight tons, were dropped into the hopper, fed through the de-stemmer and delivered on a vibrating shimmying stainless-steel table that nervously but gently jiggled pristine whole grapes from one end to the other. We were to pull out any green stems, bugs, leaves or other “extras” so that what fell off the table into half-ton vats or barrels were grapes and grapes alone. Despite our best efforts to be focused, efficient and effective, we were often times bested by that darn table. The fruit would shimmy down while we stood by like that episode of “I Love Lucy” where the girls try to hold down jobs in the chocolate factory. We were stationed at the table from 8 a.m. until 6:30 p.m., with a short break for lunch. We stared and grabbed and picked and missed and panicked and squealed. We pushed grapes back on the table when things got too hairy, trying to extract every spikey stem we could. Because of their resemblance to that childhood game, jacks and marbles, the neon-green stemmy nemeses were known as “jacks.” We wanted to kill the jacks!!! By the time the workday was over, we’d been on our feet all day, hunched over with spines compressed. We’d encountered creepy bugs, three-inch slugs that resembled gelatinous pink shrimp, yellowjackets (which stung us once or twice) and countless other critters. After 10 hours, we welcomed the chance to relax, stretch out and recuperate. We had a beautiful dinner at the Calistoga Inn, followed by bed. There was no staying up late. This was a day of hard work, and we were bushed! Most of us greeted the next morning with a fair amount of pain and stiffness. We stretched and moaned, and stretched some more. The 1974 vintage Morisoli, tractor. Next, we traveled to another vineyard source for Amici: Beckstoffer’s Missouri Hopper Vineyard. It was amazing to see the difference in viticultural approaches, as each plot was trellised in a drastically different fashion, and planted at almost opposite angles. One section seemed to be running free, growing as nature would have it; another was trained and disciplined beyond belief. Both sources are known to consistently produce some of the finest Cabernet in Napa. It just goes to show there is not one best way! After our field trip and a quick snack at Model Bakery, it was back to the winery for more sorting. 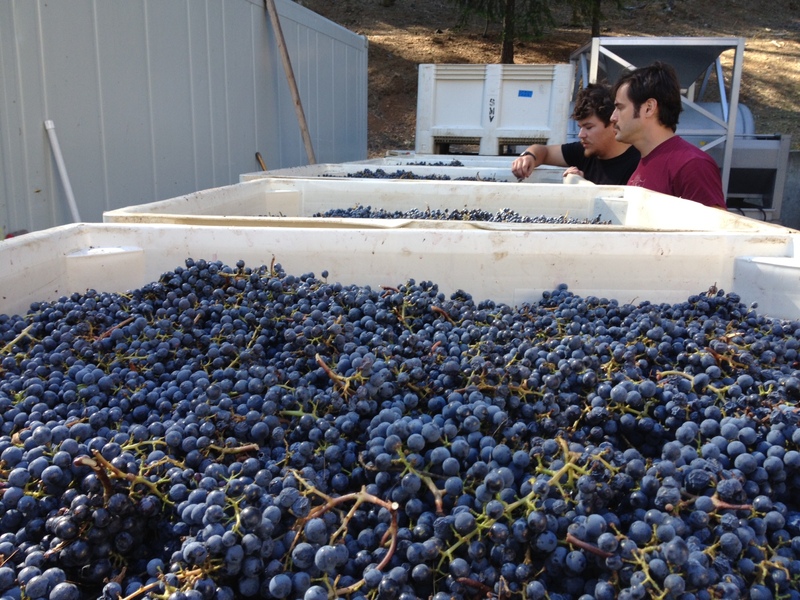 We sorted through five more tons of grapes, which included two lots from Morisoli – one to be used in the Amici wines, and one for Amy Aiken, the winemaker and owner of Meander Wines, and partner in the Palisades Wine Company along with the Amici partners. There was a clear difference between this fruit and the batch we’d sorted the previous day. These berries were juicier, offering free-run juice with just a look. And, much to our surprise, the fruit was virtually free of jacks. It was almost a dream to sort this after the experience we’d had the day before. Had we honed our skills, so the task seemed a breeze? Or was the fruit cleaner because it was riper, and separated from its green pieces with less effort? 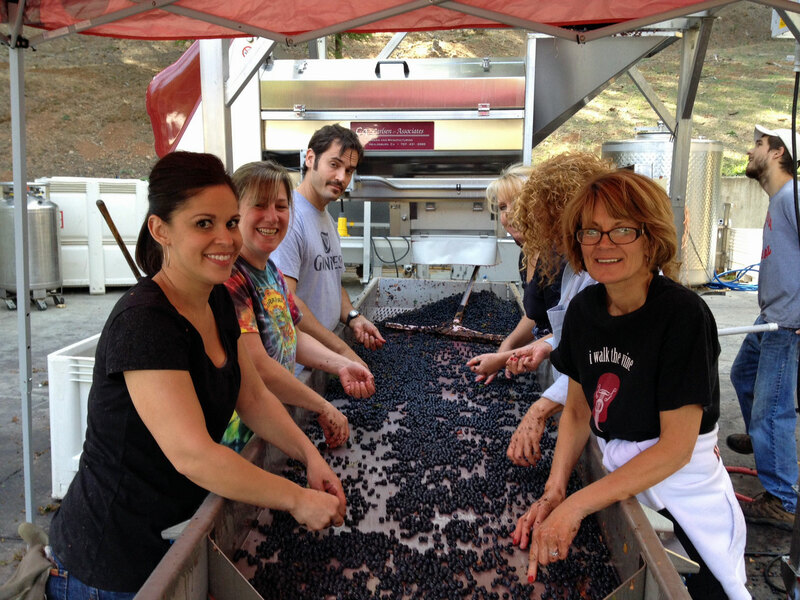 For the next two days, we continued to sort fruit from Spring Mountain and other vineyards. We also got to play in the winery: punching down caps, pumping over, draining tanks, feeding yeast, inoculating and tasting samples from the tanks and barrels. We had time to visit with the quiet but wonderfully accomplished winemaker, Joel Aiken, who previously spent more than 25 years with Beaulieu Vineyards. Joel now makes wines for several wineries, including Amici, Rarecat, Chase and under his own label, Aiken. John Harris and Bob Shepard, two of the owners and driving forces behind the Amici wines, talked with us about philosophy behind the brand, and goals for its future. They were wonderful hosts! Even someone like me, in the wine business for more than 15 years, stood to learn a thing or two from these gentlemen. Whether it was related to finance, viticulture, competing winemaking techniques, brand marketing or a whole host of other wine topics, they offered insights that could only be gleaned from truly experienced insiders. Overall, the experience was eye-opening and immeasurably valuable. We came to understand the level of passion and commitment and just plain hard work required to make a winery successful. 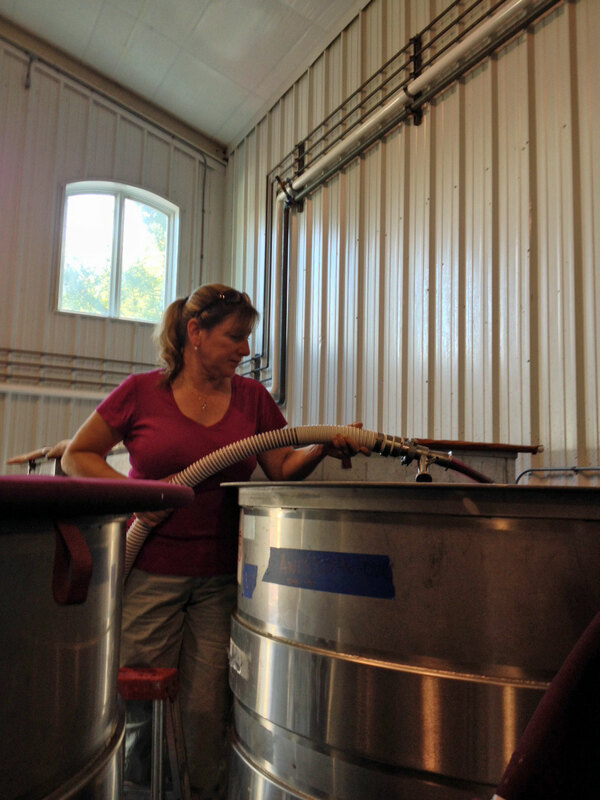 The team at the winery was extremely patient, wonderfully competent and confident. Each of the participants in boot camp brought their own set of experiences, knowledge and personality. 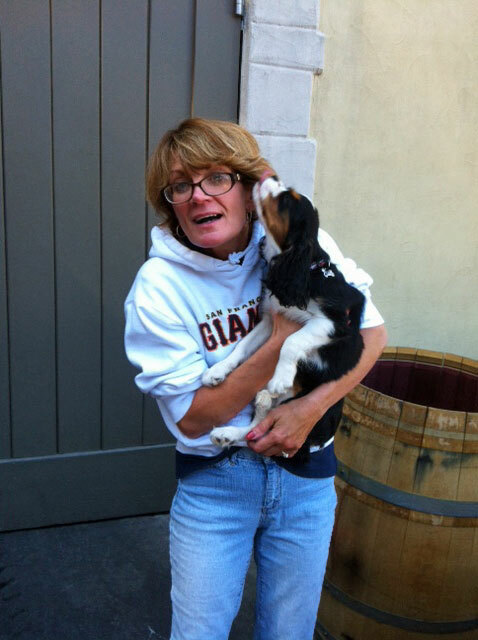 We worked until it hurt … ate great food and drank amazing wine … made new friends … learned a little something along the way … and helped make incredible wine. The 2013 vintage looks to be one of the better ones in recent history. Know that your team at Total Wine & More helped make the Amici 2013 production the best it can be!